Just $5 per person, kids under 12 free. Please register by June 10th. To register, or if you have questions, please email obrienjja@umsl.edu. The Google Map link shows a pin at the Windegger Shelter. The Gloria Rogers Shelter is at coordinates 38.621031, -90.366127. The St. Louis Section of ACS held the annual Awards Night Banquet on April 13th at Maggiano’s Little Italy on the Boulevard. Guests of the evening included 30 high school students, 9 college students, and 7 high school teachers. Parents, research mentors, and members of the St. Louis Section brought the total to 116 attendees – an all-time record attendance. Following a scrumptious Italian dinner, Provost and Executive Vice Chancellor of Academic Affairs Holden Thorp of Washington University engaged the audience with a description of anti-fungal drugs developed by his company (Viamet). Using simple concepts of Lewis acids and bases, he explained the interaction of two potential pharmaceuticals with metalloenzymes. Section Chair-Elect Dr. Joseph Ackerman presented certificates and awards to the winning students and teachers. Section Chair Dr. Pegah Jalili concluded the evening with congratulations to all the winners and their families. On March 13 or 14, hopeful chemistry students from area high schools gathered to compete in the Saint Louis Section High School Chemistry Contest. Places are based on a written test. The Regular Division exam is open to students who are in their first year of high school chemistry (other than an AP course); the Advanced Division is for those taking their second high school chemistry course or AP chemistry. Each exam has a multiple-choice section and then a “tie breaking” section that consists of short-answer and essay questions. Congratulations to all of the 2015 winners, listed below, and to their teachers. All were invited to Awards Night, April 13, as guests of the Section and were recognized for their achievement. Five students qualified for the National Chemistry Olympiad competition based on their performance in the high school chemistry contest. The Olympiad exam consists of a 90-minute multiple-choice section, a 105 minutes of free-response questions, and a 90-minute lab practical. The exam was held at UMSL and supervised by Keith Stine and Harold Harris. These students will compete against others across the country who also qualified for this exam. The top 20 students in the nation will be invited to a two-week summer chemistry training camp at the Air Force Academy. The four best of that group represent the US at the International Chemistry Olympiad, which consists of a five-hour lab practical and five-hour theoretical exam. This year’s International Olympiad will be held in Baku, Azerbaijan. 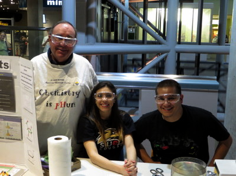 Don Sartor, Marisa Gonzalez, and Daniel Gutierrez pause from Crushing Cans at the Kids and Chemistry at the Saint Louis Science Center for Chemists Celebrate Earth Day on 4/18/15. 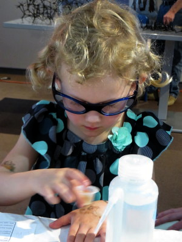 Emma Landsness experiments with mixing for the Enzymes experiment at the Kids and Chemistry at the Saint Louis Science Center for Chemists Celebrate Earth Day on 4/26/14. 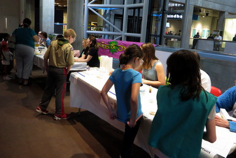 About 600 people visited Kids and Chemistry (“Starch Scavenger Hunt” in foreground) at the Saint Louis Science Center for Chemists Celebrate Earth Day on 4/15/15. 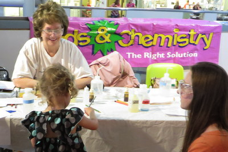 Sheryl Loux instructs how to do the Enzymes Aid in Digestion and Cleaning experiments at Kids and Chemistry at the Saint Louis Science Center for Chemists Celebrate Earth Day on 4/18/15. In the fall, members of the St. Louis Section will cast votes for ACS President-Elect, District V Director, and Councilors from the St. Louis Section. Officers, Directors, and Councilors play important roles in ACS governance, but how do these positions relate to each other? This article provides an overview of the governing bodies of ACS – its Board of Directors, its Council, and its Committees. The Board of Directors is the legal representative of the Society. It is composed of the President, the President-Elect, the most recent Past President (ex officio), six District Directors, and six Directors-at-Large. The six District Directors are elected by the members in each of six geographical Districts. The St. Louis Section is in District V; its Director is Dr. John Adams. The six Directors-at Large are elected by Councilors. Dr. Thomas M. Connelly, Jr., the Executive Director and Chief Executive Officer of the Society, is a nonvoting ex officio member of the Board of Directors. The Council is the popular deliberative assembly of the Society and acts an advisory body in matters pertaining to the general management of the Society. There are five categories of Councilors: Local Section Councilors, Division Councilors, Ex Officio Councilors, Bylaw Councilors, and Alternate Councilors. Local Section and Division Councilors are collectively known as elected Councilors. Twenty percent of elected Councilors are elected by Divisions and eighty percent are elected by Local Sections. Each Division has at least one Councilor and may have as many as four, depending on the number of Division members. Every Local Section has at least one Councilor, with the number of Councilors allotted determined by the number of members in the Local Section. The St. Louis Section Councilors are Dr. Lisa Balbes, Dr. Lawrence Barton, Dr. Donna Friedman, and Dr. Alexa Serfis. Local Sections and Divisions elect Alternate Councilors equal in number to the number of Councilors to which each is entitled. In the event a Councilor is unable to attend a Council meeting, the Local Section or Division selects an Alternate Councilor to attend the meeting. Ex Officio Councilors are the President, the President-Elect, the Directors, the Past Presidents, the Executive Director, and the Secretary. Ex Officio Councilors have full voting privileges. Bylaw Councilors are members or members-elect of any of the three elected committees of the Council who fail at any time to qualify as a voting Councilor. A member can remain as a Bylaw Councilor on the elected committee and as a voting Councilor for one additional year or to the end of the committee term, whichever is shorter. The committee structure of ACS is rather complex. There are several types of Council-related committees. Elected Committees of the Council are the Council Policy Committee, the Committee on Committees, and the Committee on Nominations and Elections. Elected Committees of the Council are composed solely of Councilors; its members are elected by Councilors. Dr. Barton is a member of the Council Policy Committee. Dr. Balbes is a member of the Committee on Nominations and Elections. Standing Committees of the Council are also composed of Councilors. Committee members are appointed by the ACS President. Standing Committees are the Committee on Constitution and Bylaws, the Committee on Divisional Activities, the Committee on Economic and Professional Affairs, the Committee on Local Section Activities, the Committee on Meetings and Expositions, and the Committee on Membership Affairs. Dr. Serfis is a member of the Committee on Local Section Activities. There are two Joint Board-Council Committees designated as Society Committees – the Committee on Budget and Finance and the Committee on Education. Each Society Committee is responsible to the Board of Directors on all matters relating to fiscal affairs, and to both the Board and the Council on all other matters. Members of Society Committees are appointed by the ACS President and the Chair of the Board of Directors. At least two-thirds of the members of Society Committees are Councilors. Dr. Friedman is a member of the Committee on Budget and Finance. Other Joint-Board Council Committees are established by joint resolution of the Council and the Board of Directors. These committees are responsible to both bodies. Members of Other Joint –Board Council Committees are appointed by the ACS President and the Chair of the Board of Directors. Members of these committees need not be Councilors. Committees classified as Other Joint-Board Council Committees are Chemical Abstracts Service, Chemical Safety, Chemistry and Public Affairs, Chemists with Disabilities, Community Activities, Environmental Improvement, International Activities, Minority Affairs, Patents and Related Matters, Professional Training, Public Relations and Communications, Publications, Science, Senior Chemists, Women Chemists, and Younger Chemists. Other Committees of the Council are established to serve purposes that the Council or Council Policy Committee deem appropriate. Other Committees of the Council are Analytical Reagents; Ethics; Nomenclature, Terminology and Symbols; Project Seed; and Technician Affairs. The composition of Other Committees of the Council are determined by the Council or the Council Policy Committee. Members of Other Committees of the Council are appointed by the ACS President. The Governing Documents of the American Chemical Society are its Charter, Constitution, Bylaws, and Regulations. These documents are in a publication known as Bulletin 5. Distinguished Alumni Lecture: Michael Groaning, Associate Director CMC, and Alliance Manager, Endocyte Inc.
As of publication time, no seminars were scheduled for this month.